Americans love to talk about breakfast. Not only is it the most important meal of the day, but it’s one of the most talked about topics in social media. From skipping breakfast, to what we’re eating (or want to eat), What America (Tw)eats looks at America’s breakfast social media habits, analyzing more than 20 million breakfast tweets over a two-year period. Despite the known benefits of a good breakfast, Americans continue to skip this important meal. There were more than 1.6 million tweets about people skipping breakfast; that’s thousands every single day. One in five tweet they skipped breakfast because they don’t have enough time to prepare or eat it each day. People in different parts of the country have different breakfast tweeting habits. East Coasters are most likely to tweet about breakfast on Tuesdays; those in the mountain time zone are most likely on Wednesdays, and West Coasters on Thursdays. New York, Georgia and Rhode Island rank number one, two and three in breakfast-tweeting states (most tweets per capita). For both men and women, breakfast is a hot topic. While females are slightly more likely to tweet about breakfast, it’s a fairly even split (54% female vs. 46% male). Our most tweeted breakfast foods may be missing the mark – missing key foods and food groups, including fruits and vegetables. There are more than 100,000 tweets about cake or chocolate for breakfast and more than 200,000 tweets for pizza. Leftovers, fast food and even pie are part of America’s breakfast discussion. Not surprising, morning beverages are pretty straightforward. While Americans still miss the mark on morning protein (experts recommend 20-30 grams of protein at breakfast, while the average breakfast contains just 10-12 grams), protein-packed discussions are common. 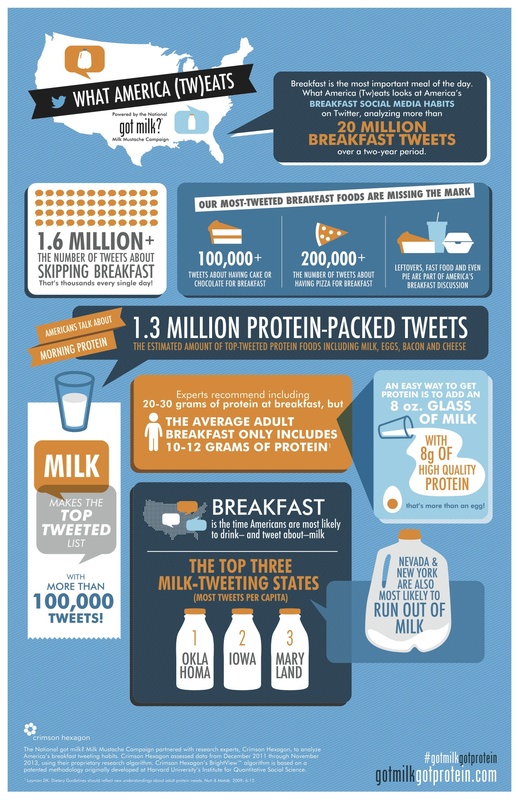 There’s an estimated 1.3 million protein-packed tweets (including top-tweeted protein foods milk, eggs, bacon). In fact, the number 1 and number 2 tweeted breakfast foods (bacon and eggs) and number 3 tweeted breakfast drink (milk) all provide protein. With 8 grams of protein in each 8-ounce glass (even more than in an egg! ), milk is a nutrient-rich breakfast staple. Breakfast is the time Americans are most likely to drink– and tweet about – milk. There are more than 100,000 milk tweets, with Americans most likely to talk about milk recipes, health benefits, milk in their coffee, and their disappointment when they run out of milk. A full 15% of tweets about milk are people lamenting they’ve run out. Many complain of pouring a bowl of cereal only to find they’re out of much-needed milk. Nevada, New York and Rhode Island are most likely to run out of milk (most tweets per capita). Oklahoma, Iowa and Maryland rank number one, two and three in milk-tweeting states (most tweets per capita). About the Study: The National Milk Life Campaign partnered with social media research experts Crimson Hexagon to analyze America’s breakfast tweeting habits. Crimson Hexagon assessed data from December 2011 through November 2013, using their proprietary research algorithm. Crimson Hexagon’s BrightView™ algorithm is based on a patented methodology originally developed at Harvard University’s Institute for Quantitative Social Science.